If you search your ancestors in Pettorano sul Gizio, Abruzzo, info about your Italian family are stored in the City Office archives or at the parishes. In towns and villages of Abruzzo and in L’Aquila province registry offices were established in early 1800: it means that you could find information in Pettorano sul Gizio registrar as of that date. So, if your ancestors were in Pettorano sul Gizio in the nineteenth or twentieth century, then you could try to contact the City Office of Pettorano sul Gizio to know more. Before to start your genealogy research in Pettorano sul Gizio, we suggest you to read our tips for your search . They are useful to search in Abruzzo and in Pettorano sul Gizio too. 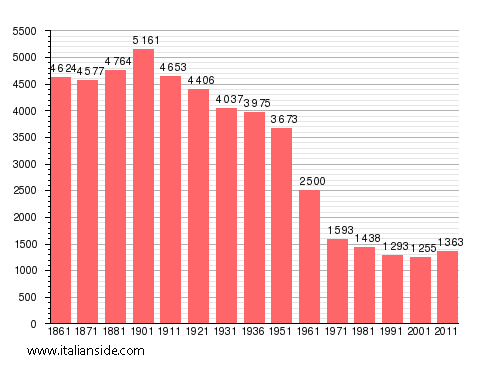 Next picture shows the demographic trends in Pettorano sul Gizio from the Italian Unification (1861) an important info to understand how many people lived there in the past. It could be important to know if the last name you are investigating is a frequent surname in Pettorano sul Gizio. As more your surname is common in Pettorano sul Gizio, as more it could be difficult to find the right info about your ancestors in Pettorano sul Gizio archives if you have not exact dates. 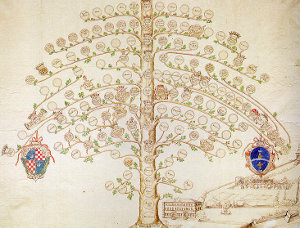 Bianchi, Bisegna, Bonanni, Centofanti, Cipriani, Colangelo, D’Alessandro, D’Amico, D’Andrea, D’Angelo, De Angelis, De Santis, Di Benedetto, Di Carlo, Di Cesare, Di Domenico, Di Felice, Di Girolamo, Di Loreto, Di Marco, Di Paolo, Di Pietro, Di Renzo, Di Stefano, Gentile, Giuliani, Graziani, Leone, Liberatore, Mancini, Mariani, Marinucci, Morgante, Pace, Paris, Parisse, Persia, Petrella, Presutti, Ricci, Rossi, Sabatini, Santilli, Santucci, Silvestri, Tarquini, Valentini, Venditti. Church archives in L’Aquila province may instead contain even older information, but they are far less accessible from abroad (and almost impossible by email). Then,parishes send information not easily. If you have the opportunity to visit Pettorano sul Gizio and L’Aquila province, you could plan to investigate churches’ archives by yourself, but from abroad is very difficult to obtain any result unless you find a reliable local help. If your research is in a dead end and you need professional help from our local Italian genealogists write to pettoranosulgizio@italianside.com our expert in Pettorano sul Gizio area will study your request and will reply to you with a research plan and a quote. Hi! I’m visiting the area this summer and I know that my family was from Pettorano Sul Gizio. My great grandfathers name was Dominico Ranalli (Born June 25th, 1906), son of Angelo and Carmela Ranalli. Their other children were Rosario and Josephine Ranalli. Carmela’s maiden name was Spaziani, related to Giuseppe “Joseph” Spaziani. I would love to know if any Ranalli’s are still located in Pettorano. Thank you! Is anyone out there from Valle Larga, the wide valley off the main state road between Pettorano and Sulmona? Both my parents are from there and I still have family there. CESIDIO SANTUCCI born 27 Jun 1884 Pettorano sul Gizio, son of ARCANGELO SANTUCCI (no dates, no place of birth, son of VINCENZO and unknown mother) and LIBERATA FRATORELLI (no birth date or city, who are her parents). AGNESE ANZUINI born 21 Mar 1884 Pettorano sul Gizio, daughter of PIETRO ANZUINI (no dates or place, who are his parents?) and LORENZA GINNETTI (no date or place) daughter of GIACCHINO GINETTI and AGNESE ??? My great grandfather Joeseph Monaco came to America with his assumed brother or cousin Dan Monaco around the time of wwi. They both listed Petterano as their birthplace on their US draft cards in 1917. I have no further information on my family there and would like to delve deeper if possible. Thank you! My maternal great grand parents are from Pettorano. My great grand father’s name was Francescantonio Tornifoglia. His wife’s name was Theresa or Teresa. I am just curious to know what her maiden name was. Any info would be greatly appreciated! Thanks! The reply by Marco speaks about his great grandfather Giovanni Zannelli. Can Marco contact me at my email address? I am looking for any contacts in Pettorano on the Federico and DeVittorio families. Rich; my husbands family is from Pettroano ; last names Federico and Pace. A Federico married a DeVittorio. My Grandfather is from Pettorano. His last name is Federico. He came to the U.S. in 1913. He stated that he had 12 brothers and sisters and was a twin. Any information is appreciated. I am looking for any available information on my grandparents – Vincenzio A. Oddi born 7/18/1889 and Margherita Marie Costanzo born 7/13/1889. Both were born in Pettorano sul Gizio. My family and I will be visiting Italy in June, and we are planning to spend a day in Pettorano sul Gizio. Thank you in advance! Hello – my grandfather was born September 11, 1897. His name was Mario Loreto Berarducci. I am interested in finding his brother and sister names and if they have any children in the area. I would also like to know where he was born as I think relatives still live there. Any help is appreciated. I am looking for information on my great grandparents. The information that I have is that they were married on October 30, 1902 at St. Nicolas Church in Pettorano. I would like to find information on where they were living, like a home address, or anything else like that. Their names were Antonio Donato Cercone and Michellina Cellini. Both of my grandparents were from Italy, I can’t remember if both were from Petterano or just my grandma….their names were Carmella Cicone and Cesidio DiFonzo. Could you possibly have that information ? Hi – my great grandparents were married in Pettorano sul Gizio in 1897. Their names were Rocco Lancia and Marie Leone. I live in the US but may be visiting Rome this summer and would love to get more information and perhaps make a trip out to this community. Can you advise as to how to trace the family tree to see if any relatives are in the area? My grandfather’s name was Vincenzo Checca. He was born in Pettorano sul Gizio in 1894 and immigrated to the USA in 1910. He return to Italy to fight in WW1. After the war, he returned to the USA. We will be in Pettorano on Sept. 18 but only for one overnight. I know it is a weekend, so likely nothing will be open. But I do know this… my great grandparents (Zannelli and Tiberio) came from Pettorano at the turn of the century. When my great grand Sebastiano Tiberio (b. March 21, 1872)died in 1944, most of his remaining family lived in the U.S. But, he left a sister, Donada Tiberio Ferrilli in Italy. While he came to the U.S. earlier with his brother, he returned to Italy and eventually immigrated to the U.S. in 1903 with his wife and settled in CT. His father was Giuseppi. His mother was Concettina Ginnetti, Gianetti, Ginetta or some variation of that name. My great grand Elvira Zannelli — Sebastiano’s wife — (b. 1881 d. 1975) came here with several sisters and a brother but left some in Italy. She came to the U.S. in 1903. Parents Pasquale Zannelli and Domenica Chiota. Does this ring a bell for anyone? Suggestions for “must see” on a weekend there — overnighting Sulmona/Pettorano sul Gizio? Does anyone know where to find the HISTORY of the Rosario Zannelli fountain? Il mio bisnonno Giovanni Zannelli nasce a Pettorano (non conosco la data di nascita) si trasferisce a Nettuno in provincia di Roma con Alessandro Zannelli.Giovanni sposa nel 1899 a nettuno Censi Angela , il matrimonio dura 10 anni da questa unione nascono due figli Umberto è Vittorio zannelli.G iovanni si separa e torna a Pettorano rimane lì fino alla sua morte. On October 16, 1924 Francesca left Pettorano to join my grandfather and her brother Charles Di Fonzo already in America. Giovanni was married to someone else before he married Francesca and they had a child named Concetta Panza. When his first wife died, he married my grandmother Francesca. I believe I have a second cousin, Anna Maria Patella, living in Sulmona who is my grandfather’s sister’s daughter. I an trying to find her, as I believe she is the only living relative I know of there. Any ideas on how to find her? To find other relatives? To research my family? hi, I’m not sure if this helps but my grandmothers surname was Patella and she was from pettorano sul gizio. her mother was giulia pansa who had approx 11 children. my grandmothers sister Assunta lived in sulmona but unsure of her daughters names. She also had a brother called Pietro, Francesco and a sister annunziata. not sure if there’s any connection. Pasquale and Felix both came to the USA Mother and a sister stayed behind in italy. Can’t find anything on my Great Grandmother or great aunt. Both of my grandparents were born in Pettorano. Grandfather Antonio Lancia 1867 and Antonia Ferrelli May 19, 1874. I would appreciate any information on their parents and or siblings. Also, could you provide me with a name of someone in the area who might be able to do further research for me. I visited Pettorano in 2005, however, it was on Palm Sunday and of course the town hall was closed. My grandfather was Giuseppe Dominic Lancia and was born in Pettorano March 11th 1898. I also have cousion named Liberate Ferrelli from the same town. I am going to visit Pettorano in May. I actually have a copy of the CD movie you created from your 2005 trip, although I’m not sure how I obtained it and how we are related. Antonio and Antonia are my second great grandparents. Were you able to find out any additional information? Would love to connect! Looking for information on my 2nd great grandparents Liberata Dosantos and Bernardino Di Pietro. Liberata Died on 9 Jan 1951. In Pettorano. I am looking for the names, etc. of the parents of Donata Spagnoli and Ricardo Lucci. Also information about Anna Maria (?) and husband, Vito (?) D’Aurora–all from Pettorano sul Gizio. Thank you for any help. Hi Mike, never heard of a Michael Tristani, but my father is Fernando born in 1926 and his father was Francesco. Don’t know his birth year but it would be around that time. My parents immigrated to Ontario Canada with all my father’s brothers and sisters. my fATHER, CRESCENZO ERNESTO COSTANZO, WAS BORN IN PETTORANO SUL GIZIO ON EITHER APRIL 15, 1899 OR APRIL 15, 1900. CAN THE CITY OFFICE OR TOWN CLERK CONFIRM THE ACTUAL DATE? MY grandparents were both from pettorano sul gizo ,Cesido susi born 4/7/1893 and my grandmother Anna Calabrese born 1894. my grandmother’s father was Gaetano Calabrese. The piece i do not know is my grandmothers mother name. my grandfathers father is buried in pettrorano and anna calabrese sister. any ideas? If you would like to start a research in Pettorano sul Gizio please send your request to pettoranosulgizio@italianside.com.